Eight arrested in police crackdown on crime families following fatal car bombing. Police have arrested eight people in a crackdown on organized crime in southern Israel. 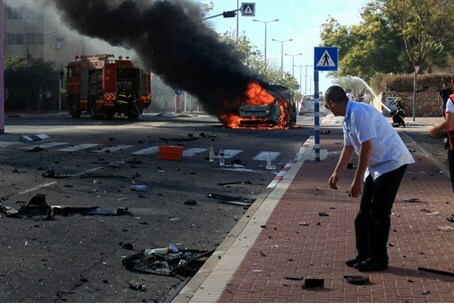 The wave of arrests follows a car bombing last Thursday in the city of Ashkelon in which one man was killed and second was badly injured. The man who was killed was identified as a member of the Domrani crime family. The second victim is a friend of his who also has a history of criminal behavior. Over the weekend, police raided several locations in southern Israel and arrested people affiliated with the Domrani crime family. According to Maariv/nrg, in an unusual move, the arrests were carried out by the police’s financial crimes unit. Police have placed a media gag order on details of the criminal assassination and subsequent crackdown. It is not clear if those arrested over the weekend are suspected of involvement in Thursday’s bombing, or if they may have been arrested in an attempt to prevent a revenge attack. In August police arrested three men suspected of running a bomb-making ring from a residential neighborhood in Netanya. The arrests followed a wave of crime-related bombings in which several innocent bystanders had been injured. Innocent bystanders have been killed in past crime-related attacks. An attempt in 2003 to kill crime boss Zev Rosenstein using a bomb killed three innocent people in Tel Aviv. Bystanders have been killed in shootings, as well; in 2008, a 31-year-old woman was shot and killed at a beach in Bat Yam in a case of mistaken identity between criminal gangs, and in 2009, a mother of eight was shot and killed in a war between rival Arab clans.